Although small this part must be have special treatment, the function of spark plugs can not be underestimated. Spark plug a vital role in the process of combustion to produce energy, so that vehicles can drive. Spark plugs are necessary components of the vehicle to start the engine. This component is in charge of producing an electric spark to burn the air fuel mixture in the cylinder vehicle. A good spark plug capable of working in high temperatures and pressures. Because of work directly related to the engine, spark plugs can be used to identify and find the cause disruption on the machine. So, when you clean the spark plug at a time can check whether the machine is still excellent condition or have been sluggish, just by observing the head of the spark plug. Vehicle engines called normal if it is still an insulator and electrode tip spark plugs light gray or reddish brown. This shows the conditions and engine settings and ignition timing in top shape, and still in accordance with the state factories. If you see the end of the insulator, and the spark plug electrodes covered with a black action je, combustion of the dry but soft, you should quickly check Stelan or injection, choke mechanisms, air filters, if necessary, replace the spark plugs that fit, because most likely there is a lack of fit in these parts. It's nothing, interference with the earlier components will cause a black menjadin automobile exhaust fumes, gasoline wasteful, and difficulty starting when engine is cold. Have you ever experienced stagnant and slow the engine when the vehicle accelerates fully charged, or explosive exhaust because the fuel is not burned out (misfiring)? If yes, check your spark plugs, would end insulatornya seemed somewhat light brown yellow and green colors sometimes appears a bit wet. This shows gasoline and other materials such as oil polluted water, or use a less suitable additives. 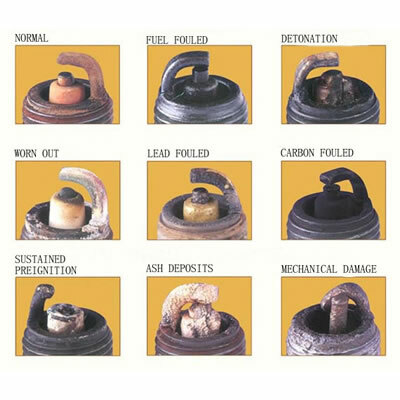 There are many other examples that show the spark plug faces look good or bad conditions of vehicle engines. But do not also forget to take care of the spark plug itself. Some experts recommend that the mechanical spark plugs are always cleaned after the car runs about 2500 km, and was replaced after 10,000 km to 15,000 km. for safety riding motorbike : let's cek the spark plug before riding.